I was watching this Swedish tv program when something caught my attention. This man was preparing homemade ice cream for his guests which made me remember one of my favorite flavours of ice cream ~~~ mocha! Mocha flavoured ice cream is difficult to find here in Sweden. Oh wait... I've actually seen one by Häagen-Dazs®. The price isn't that friendly and so, I've decided to put my mocha-ice-cream-craving to a pause. 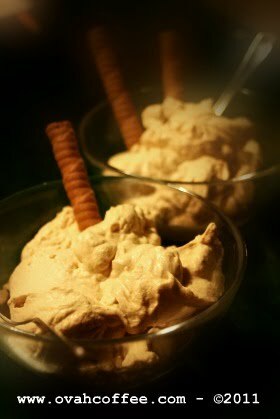 So, well... recently, I took the chance of fixing my own mocha ice cream from scratch for the first time. Thanks to that tv program. It inspired me a lot! Anyhooo... I searched the internet for ice cream recipes and with thousands of tips and instructions online, I had no reason not to try it for the first time. That night, my boyfriend and I had mocha ice cream for dessert. I liked it. He loved it. According to my boyfriend, there's nothing more delicious than a glass of ice cream made by the one who loves you. So there you go! My first homemade ice cream is a success! I am thinking of creating mango ice cream next time. We'll see! New follower- Sounds absolutely yummy. Great site as well!!! btw te maxi, these are my updated blog links..
i've already added your blogs there..if u have time, u can check..then ping me if some missed links.. thankie!!! te maxi! nashock ako sa name kong anlaki sa sidebar mo sa commenters!LOL! Oo nga. Yummy talaga ito, GG! Got it! Thanks GG! Will fix things ASAP. Will PM you on Facebook kung okey na. Mwahugs! Jag gjorde chokladglass i går. Den var god. Haha. Talent ko rin kumain nang kumain. Buti nalang, marunong din akong mag-bake, etc. Hello hello! Thanks for following my blog. Will definitely follow yours, too. I am just having this blogger issue at the moment and still waiting for Blogger to help me out. But when everything's solved, I'll follow your blog, too for sure. Will also visit your blog in awhile. Have a pretty day! Cheers Maxi to your success with the frozen treat. Personally, I'm not a mocha fan ... but that's ok. Here's an online treat for you. Graeter's is an outstanding local ice cream for us in Cincinnati. Very rich and creamy ... yes, pricey in the grocery stores, but still a wonderful treat to celebrate with that special someone. See the pics on this link ... especially the chip flavors as the chips aren't chips, but chunks of solid chocolate from their candy division. YUMMY! ate maxi..i have an award for yoU! Oh no! Frank! I've been to that link and yum yum.. Yummy pics of ice cream! I will definitely try them when there. Thanks again for sharing the link, Frank! Hugs hugs and more hugs! Got it GG! Will grab it ASAP! I have three awards that I need to grab. Weee! Thanks!